(Al Hartmann | The Salt Lake Tribune) Sarah Allred had two daughters born on the FLDS compound in South Dakota, but did not get birth certificates for them due to secrecy by the FLDS. She talks to a South Dakota judge in a telephone hearing Thursday Sept. 14 with lawyer Roger Hoole in Salt Lake City to ask for South Dakota to issue birth certificates. The judge granted the birth certificates for the children, ages 6 and 9 years old. (Al Hartmann | The Salt Lake Tribune) Sarah Allred had two daughters born on the FLDS compound in South Dakota, but did not get birth certificates for them due to secrecy by the FLDS. She talks to a South Dakota judge in a telephone hearing Thursday Sept. 14 with lawyer Roger Hoole in Salt Lake City to ask for South Dakota to issue birth certificates. The judge granted the birth certificates for the children, ages 6 and 9 years old. (Al Hartmann | The Salt Lake Tribune) Sarah Allred had two daughters born on the FLDS compound in South Dakota, but did not get birth certificates for them due to secrecy by the FLDS. She talks to a South Dakota judge in a telephone hearing Thursday Sept. 14 with lawyer Roger Hoole in Salt Lake City to ask for South Dakota to issue birth certificates. The judge granted the birth certificates for the children, ages 6 and 9 years old. (Al Hartmann | The Salt Lake Tribune) Sarah Allred had two daughters born on the FLDS compound in South Dakota, but did not get birth certificates for them due to secrecy by the FLDS. She talks to a South Dakota judge in a telephone hearing Thursday Sept. 14 with lawyer Roger Hoole in Salt Lake City to ask for South Dakota to issue birth certificates. The judge granted the birth certificates for the children, ages 6 and 9 years old. (Al Hartmann | The Salt Lake Tribune) Sarah Allred had two daughters born on the FLDS compound in South Dakota, but did not get birth certificates for them due to secrecy by the FLDS. 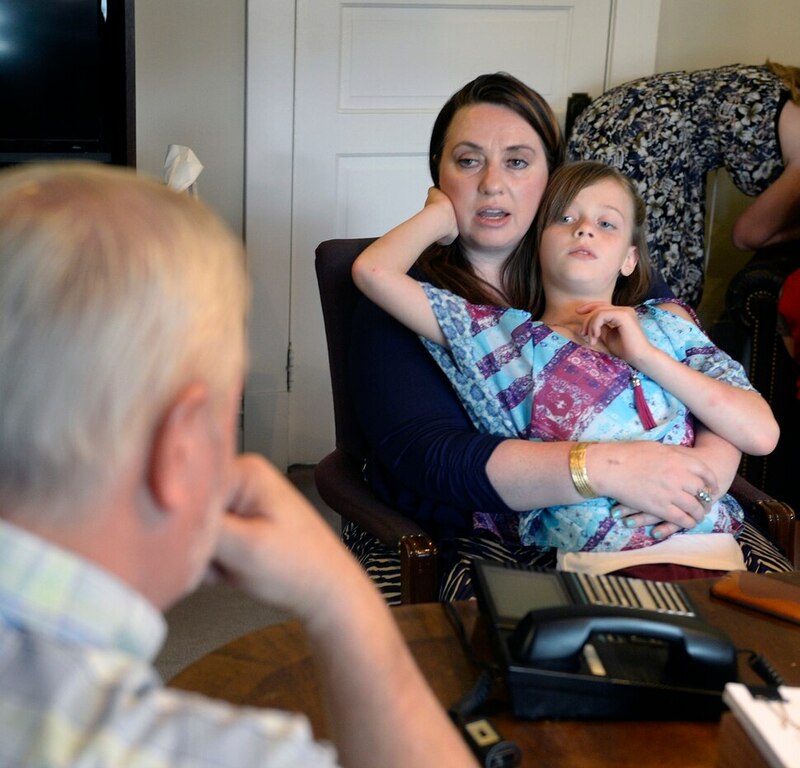 She talks to a South Dakota judge in a telephone hearing Thursday Sept. 14 with lawyer Roger Hoole in Salt Lake City to ask for South Dakota to issue birth certificates. The judge granted the birth certificates for the children, ages 6 and 9 years old. 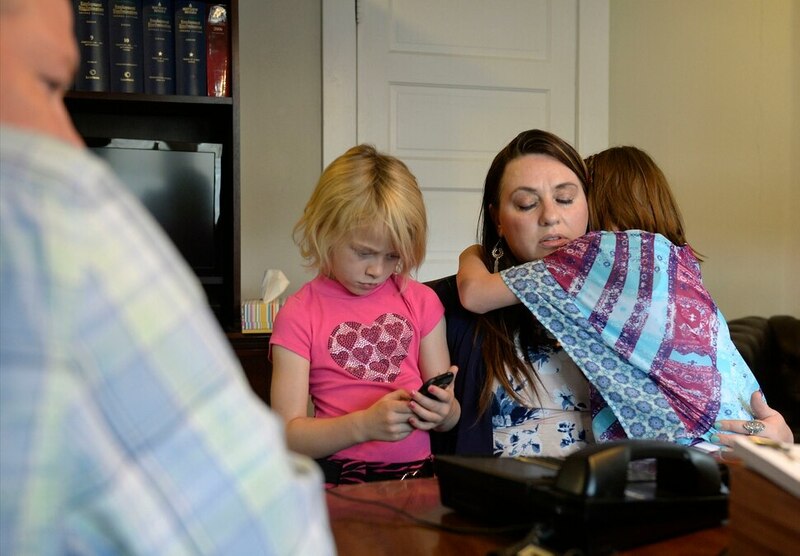 Holladay • After hanging up from the conference call with the judge, Sarah Allred turned to her 9- and 6-year-old daughters. “I was always your kid,” the 9-year-old replied. Yes, but without birth certificates, it was difficult to prove that. The two girls were born in secrecy on the polygamous Fundamentalist Church of Jesus Christ of Latter-Day Saints compound near Pringle, S.D. At a hearing Thursday, most of which was conducted over the telephone, a state judge in South Dakota heard testimony about their births and agreed to issue an order requiring the state’s Department of Vital Records to issue birth certificates. Seventh Circuit Court Judge Jeff Davis signed the order later Thursday, Allred later told The Salt Lake Tribune. Once it has been served on the state agency, the certificates should be issued in two to four weeks. Allred has been seeking the birth certificates for three years — ever since she gained custody of the six children she had with her now ex-husband. The four oldest were born in Utah and had valid birth certificates. But the youngest two were born on the South Dakota compound. As Allred explained to the judge during the conference call, FLDS President Warren Jeffs wanted what went on there to remain a secret. “We were not allowed to get birth certificates per the leadership,” Allred said into the telephone speaker. One daughter was born at the compound in late June 2008. The other was born there in September 2010. Allred answered questions about the children’s father. She was “assigned” to marry Richard S. Allred. They were legally married in Utah‘s Washington County in 1998. She was 18 years old. Richard Allred went on to marry four other women as spiritual wives. He and Sarah had six children in all. The girls born at the compound, delivered there by a midwife who was not licensed with the state of South Dakota, Sarah Allred has said, are the youngest. The legal case was complicated by a lack of documentation. When Sarah Allred was sent away from the FLDS in 2012, she had few church documents or photos of the girls. Sarah Allred and her Utah attorney, Roger Hoole, searched multiple states looking for any records showing that she and her husband were caring for the girls as infants. 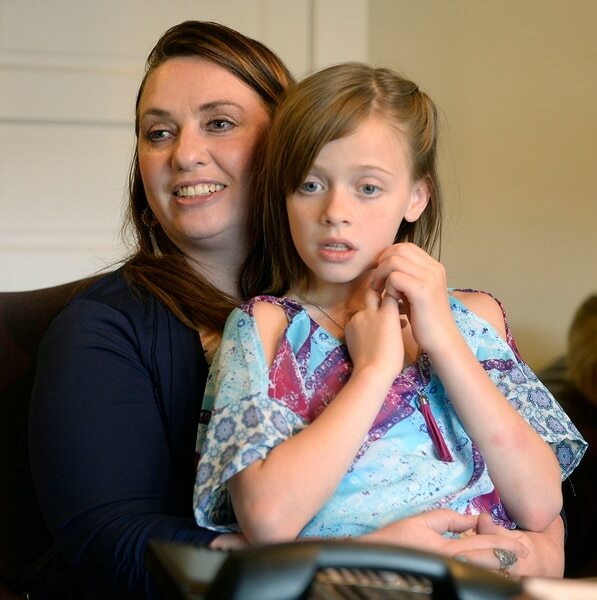 What records could be found, from hospitals, former church members — as well as Allred’s divorce decree last year where a Utah judge found she and Richard Allred were the girls’ parents — were submitted as evidence to the judge in South Dakota. A South Dakota attorney, who took Sarah Allred’s case pro bono, represented her in the judge’s courtroom on Wednesday. One of Sarah Allred’s teenage daughters also testified during the call from Hoole’s Holladay law office. She told the judge she was living on the compound at the time of her youngest sisters’ births, helping care for other children, and met each girl within hours of their respective births. Sarah Allred hugged her 9- and 6-year-olds after the hearing ended. She said she knows of 13 other children born at the compound from 2006 until she left in 2012, including four others born to Richard’s spiritual wives. All of those 13 children have birth certificates, Sarah Allred said. But their mothers all reported the children were born at the birthing clinic in Hildale, Utah, which is the FLDS’ traditional home base, or other locations where the FLDS own property, she added. The mother and children have been living in northern Utah. Richard Allred has not responded to any of the court petitions for custody, child support or divorce. Jeffs is serving a sentence of life plus 20 years in a Texas prison. He was convicted of charges of sexually assaulting two girls he married as plural wives.